The following is a guest post by Ashu Garg, general partner at Foundation Capital. Disclosure: they invested in TubeMogul, which is mentioned in this article, as well as other adtech and martech companies. The evolution of marketing technology has come a long way this year. When I first published MarTech and the Decade of the CMO — the white paper that predicts the 10x software revolution that is coming to marketing — CEOs were just starting to think more deeply about integrating technology into their marketing organizations. Today, it’s at the forefront of their conversations and meeting agendas. We recently gathered CMOs and VPs of marketing from an array of industries at our second annual Foundation Capital CMO Tech Tour for a day of frank conversation about the marketing opportunities and challenges that are just around the corner. And over the course of the year, we’ve had hundreds more conversations with entrepreneurs and MarTech leaders about many of the same topics. So with 2015 coming to a close, it seems like the perfect time to share our predictions for the top five biggest challenges marketers will face in 2016. 1. Marketers will embrace point solutions, driving wider-scale MarTech adoption. One thing I consistently hear from senior marketers is that they face a huge challenge when deciding how best to approach the task of automating their entire marketing function and, more specifically, how to evolve their marketing activities as a whole into a technical discipline. This oftentimes manifests itself in the conversation about whether single-point or stack solutions represent the future of marketing. “Single point” refers to a marketing platform or software that addresses a very specific customer need or a solution that helps manage a specific aspect of marketing automation like social media, CRM, analytics, or email. The theory behind single-point solutions is that an organization would find the best, deepest solution in a single vertical of their marketing activities, then integrate that software, either manually or system-wide, into their daily activities. In 2016, we’ll see marketers actively embracing single-point solutions, which will drive technology even deeper into the heart of marketing organizations across the world. However, challenges will arise as this adoption spreads, especially when overarching integration is required across large marketing departments. Compatibility: will these single point solutions play nice together? 2. CMOs will define the MarTech stack (and reject the suite of standalone products). On the other side of the spectrum, the “stack solution” is a one-to-rule-them-all business or marketing platform that contains all the functionality needed to execute and organize a company’s activities. A stack solution brings together what would otherwise be disparate single-point solutions into one program. This uber-system may be the silver bullet that marketers have been looking for — one program, one training, and one place that organizes various assets, plans, and metrics. Practically speaking, however, one size doesn’t always fit all, and CMOs and their staffs often have nuanced, constantly evolving needs that may be better served by one-off or single-point solutions. Ultimately, CMOs will define what they need in a marketing stack and usher in a system-wide approach to driving technology into marketing. This kind of top-down approach will happen simultaneously with the adoption of single-point solutions. At its core, the all-in-one promise of the stack is what everyone wants, but finding the best fit for a range of needs presents a much larger challenge than do the (relatively) simpler single-point solutions. As the various implementations and experiments in single-point and stack solutions evolve over the next 12 months, a clear winner may emerge, but it’s far too early to tell. The startups we work with are actively looking to remove the pain points between single-point and stack solutions, and we’re continuously learning from CMOs about what types of solutions best serve their needs. 3. Virtual Reality will become a reality for brands. Samsung’s $99 Gear VR was recently released, and the consumer launch of the Oculus Rift is just a page flip of the calendar away. As Hollywood, Silicon Valley, and some of today’s biggest brands start diving into VR mania, the question we’re asking ourselves is if VR will finally emerge as a major new entertainment, marketing, and computing platform in 2016. The immersive social and digital worlds of virtual reality promise new experiences and applications, many of which haven’t even been imagined yet. The looming decision for brands in 2016 is whether they begin shifting their focus to VR by adding budget and people-power to this burgeoning opportunity or use this period to listen, learn, and then strike when the right moment hits. There will surely be some first-mover advantage as we have seen with other new platforms (e.g., GE and other brands jumping on Instagram early), which will certainly keep some CMOs up at night. How will VR affect my brand marketing, advertising, content production, and user-experience design? What’s the best way to prepare for VR? Is first to market worth the cost and potential pitfalls — or is not being recognized as a trailblazer just as costly? Who will brands partner with to create experiences? Startups or bigger players? Fast-moving startups may have the innovation upper hand to break new ground. These answers will surely begin to surface over the next year, but one thing is for certain — VR must be on the minds of today’s CMOs so they can be best prepared to choose the right path for their brands in the future. 4. Brand marketing moves beyond TV to video. As I discussed at our CMO Tech Tour, consumer habits are shifting like never before — mobile and social are the new channels of discovery for television, and where and how to watch video has become a choice with nearly endless possibilities. This shift in behavior has marked the slow decline of traditional TV, but a new landscape of original programming, clips, and on-demand video content of all kinds has arisen from the ashes, which marketers must not only understand but fully incorporate into their brand marketing strategy. In the past five years, with the help of companies like Netflix and Tubi TV, consumers have taken all of the power. Today, viewers, especially millennials, choose what they watch, when they watch it, and on which device. According to a comScore study, millennials spend 60% of their video viewing time on-demand via mobile. And we forecast that by 2020, 40% of all video content will be streamed. Furthermore, AT&T research shows even when people watch linear TV today—almost 88% are also engaging with another device. This seismic shift will affect every corner of marketing and brand advertising. And it will create new opportunities internally at organizations, with agencies, and at startups that can build ground-up solutions for this new world. 5. Agencies will evolve to new models (finally). In this new world of video, the agency model for development and implementation will be forced to flip or pivot. If they don’t, new entrants will step in to fill the gaps, leaving more-traditional agencies struggling while they cling to old models. This new agency paradigm will focus on technology platforms that can deliver unique, personalized video content to users no matter what device they’re on or what kind of content they’re enjoying. And in turn, the way brands deliver advertising to television and video will rapidly restructure. Startups like TubeMogul are already leading the charge, offering programmatic media buying across channels with a unified view of performance. MagnaGlobal and TubeMogul research predicts that digital-video-advertising marketing will grow to $50B by 2020. But that’s just the tip of the iceberg. We believe that at least half of all TV advertising will shift to digital because of the changes we are experiencing in consumer behavior. The combined opportunity will be an addressable market of at least $175B per year. No matter where your brand’s TV or video budget lies today, understanding these consumer shifts and then cementing a newfound strategy for advertising will be a pivotal challenge for marketers over the months ahead. These predictions are already starting to take shape in boardrooms across the globe. So which startups will be there to help CMOs? And which CMOs will lean into the changes and push their brands forward faster and in a smarter, more technically driven way? It’s an exciting year ahead, and we can’t wait to see the answers 2016 holds. Regarding the Single Point vs Stack solution, a two big drivers of this are: 1) maturity of the marketing team — how prepared/capable are they across all aspect of Marketing automation, and 2) Stack solution costs. Stack solutions sell you a majority of the capability up front and for a significant costs compared to point solutions. One solution to this, but requires a shift in business approach, is a graduated fee for services used. More organizations are ready and capable of Lead Scoring and funnel modeling whereas fewer are ready for Nurture programs or personas. While this is done to some degree today, more could be done to allow the stack to grow as the team is capable….otherwise its a big investment and CMOs therefore have to dial the returns up. Thoughts? Challenges to this position? Michael, you raise an excellent point about the graduated model. And I agree that the MarTech business model will have to change. I’m sure this will be a hard pill to swallow as there will be a short-term reduction in cash flow as users pay for what they use. But, there is a silver lining. As the MarTech companies work with their customers, educating them on nurture programs and enabling them within their product, the nurture programs will be much better than the ones a customer could have produced alone. As a result, customers will have more successful campaigns with increased stickiness to the MarTech product(s). What’s more, there will be a stronger appetite for more paid features. Steve — you got it. the “Win Win” scenario is definitely a longer term play but is IMO the best strategy. The risk of continuing down the current paths is customer disenchantment with MarTech due to increasing complexity (more integration points) and higher cost, less productivity (due to more vendors). If there is any significant consolidation in this space in 2016, which is highly likely, that would be a good time to switch to the longer term model. Good article Anshu. However the age old question is would there be any one or two Stack Solutions that can actually deliver all of the components as well as single point solutions. Will a single Stack Solution be the end goal or will there be open interfaces developed between Single Point solutions that will enable someone to tie in the best solutions together? An interesting post although across the spectrum It appears mobile has been slighted here. In response to some other comments, I have seen that many of the smartest point solutions are not necessarily only solving one problem or providing a single feature. Rather, or at least in the enterprise realm, they are offering a suite of capabilities that address an area such as mobile. The best have assembled a network of partners and integrations that will allow their customers the most flexibility and value across their entire marketing stack. Hi ashu, you’ve raised some really important points here. The martech structure has certainly been at the forefront for most organisations I have interacted with, particularly how to fit CRM systems into an existing model. The only one that hasn’t yet caught on and might take some more time is VR. If I had to pick a top 5, I’d probably replace that with content marketing. Given where we are with content there is an immediate and increasing need to have an agile content production and distribution marketing infrastructure. And frankly most organisations that get this also realise how much their current technology stack fails to deliver. Any thoughts on how the importance of content plays into your predictions for 2016? 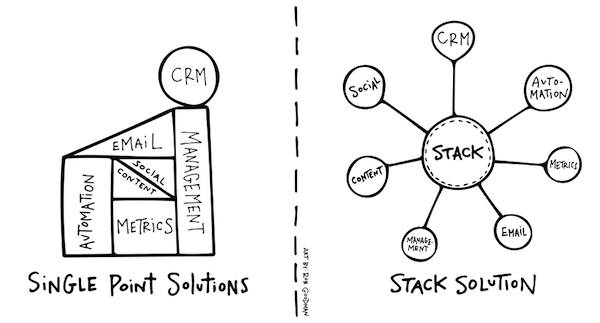 The stack solution as it is described is confusing – “one-to-rule-them-all business or marketing platform” . Is that a stack or a platform? This way you allow capable development teams to focus on making one specific solution awesome. As these integrated apps grow together it is relatively straightforward to build co-marketing deals that make it less of an issue for the client’s wallet. Also if a better solution comes along, that component integration can be pulled out without having to do a complete review of the “one-to-rule-them-all” platform. 1) What is best in class for this use case? 2) Does it integrate with my other solutions? Sorry to be a fuddy duddy but with all this concentration on fascinating new tech developments the fundamental problem of the ‘brain drain’ of those best at creating brilliant ideas remains unaddressed. All well and good talking about fundamental shifts in marketing and advertising but what does it all matter if what happens is a swap of technically savvy folks for creatively brilliant ones? Currently what we’re seeing is a whole bunch of wonderful new tech hosting dull and dowdy creative. The medium is only the message up to a point. I would like to add more point here. Identity is another buzzword that is taking the online business world on troll. Identity has started to become the future of marketing. Identity being the center pinning that can stitch a single view of the customer interacting from different channels and touchpoints, as well as the starting point to understand and serve customers personalised offerings. Marketers can be at an advantage enabling a customer identity management solution on and across their web properties.What do you think?